LEGO unveiled its first ever Ghostbusters set at Toy Fair 2014 yesterday, which features LEGO versions of Peter Venkman (Bill Murray), Ray Stantz (Dan Aykroyd), Egon Spengler (Harold Ramis) and Winston Zeddemore (Ernie Hudson). 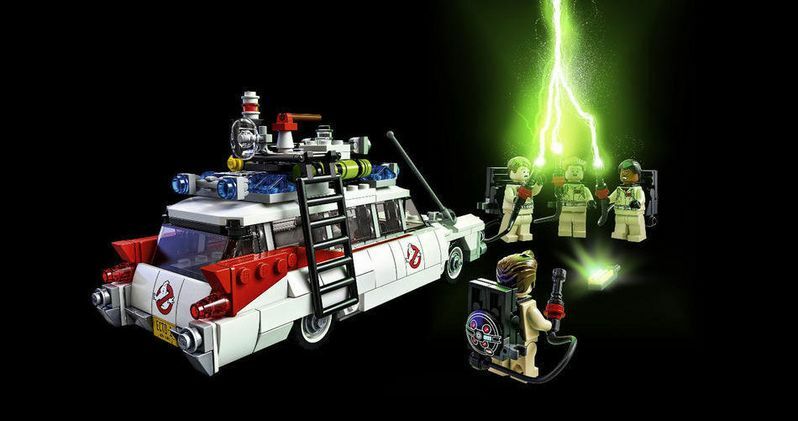 The 508-piece set also allows fans to build their own version of the Ecto-1 vehicle, which comes with a removable roof and seating for three mini-figures. Also included in the set is the group's equipment, the Ghostbusters logo decorations and a tracking computer. Take a look at these photos, then read on for more information about the set, which debuts in June. The concept for the set is based on an original submitted to Lego CUUSOO from Brent Waller, a 3D Environment Artist in the video game industry from Brisbane, Australia. The Lego CUUSOO program (Lego.Cuusoo.com) allows fans to submit ideas for toy sets that have the potential for commercial production. If Lego approves a fan-submitted idea, the designer receives 1% of all the toy royalties. The set's release in June will coincide with the 30th Anniversary of the original Ghostbusters movie.